Over the past decade, with the popularity of TV shows like Changing Rooms, the trend for old-fashioned bathrooms has seen a real upsurge. A rare gem of an old slipper bath or rusty traditional tap may be found at a scrap yard or in a skip, but thankfully manufacturers are keeping up with demand with skilfully crafted traditional bathroom products. Almost always, the bath is the centre piece attraction of the traditional bathroom. 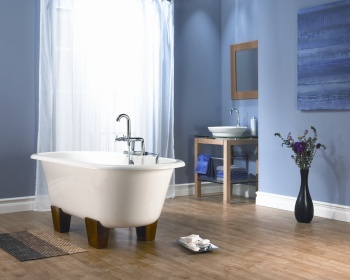 A free-standing roll-top or slipper bath sits proudly on a dark polished floor, and only if going for a traditional continental style bathroom will an inset or sunken tub hold appeal. Either a wall-mounted tap or a free-standing one looks classy. Deep ridges and curved angles are what makes the traditional sanitary ware what it is - bold and masculine. One of the most appealing things about the traditional bathroom is clutter gives it more of a lived-in effect, thus enhancing the traditional look. Don’t be afraid to put plenty of pictures on the walls - black and white family portraits in gold frames are a good look. A chest of drawers or corner table with scented candles, aromatherapy oils or flowers will really bring the room to life. As a finishing touch an old style set of weighing scales, a large framed mirror or bulky traditional radiator will give the room that cosy old-fashioned feel.